The former Ateneo de Manila University professor Christina Astorga put in the hot seat after expressing of her thoughts on Duterte's promise to eliminate crime in 3-6 months, SALN, and in the 24 hours corruption hotline. Prof. Christina Astorga saddened from all of the negative comments she received from Duterte supporters. 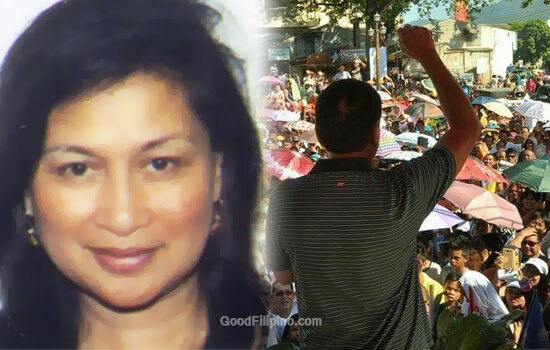 "I AM A FILIPINO CITIZEN WHO EXERCISES HER RIGHT OF SPEECH. CALLING A SPADE A SPADE. A CALL FOR PRESIDENT ELECT TO WALK HIS TALK!," professor said. According to Prof. Astorga, she read all the comments of the Duterte supporters from the post about her FB message that was recently published on this website. She said,"I read all the comments of the Duterte supporters on this posting. They were vulgar, crass, and bastos." "Instead of arguing intelligently on the points of this posting, they all attacked me personally, calling me gurang, prostitute, tanga, bobo, drug addict, binayaran, etc," she added. The professor who is now at the University of Portland wants to make clear the issue. She only wants to express her rights as Filipino, the same right as any Filipino to express their views on Filipino politics. Prof. Astorga said, "I am a Filipino citizen. I voted last election. I have no intention at all to change my citizenship. I am a proud Filipino citizen representing my country in the States as professor and scholar." "We are now called to be global citizens in a world that is highly globalized. We have to represent our country on the global stage," professor added. 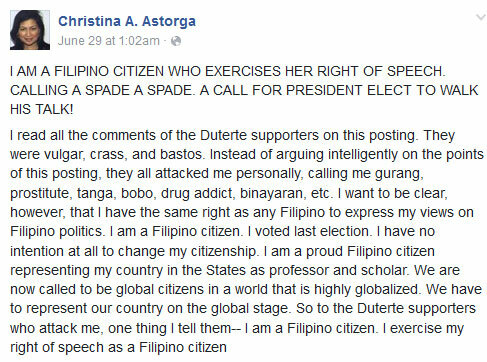 And to all Duterte supporters who attacked professor Christina Astorga through negative comments, she want to tell you this, "I am a Filipino citizen. I exercise my right of speech as a Filipino citizen." Do you agree with professor Christina Astorga's thoughts? Please share your opinion below. Comments or suggestions about "Former Ateneo professor express 'rights' against Duterte supporters" is important to us, you may share it by using the comment box below.